I’ll drive thru rain and smog for my Road Dog!!! March 24, 2015 March 24, 2015 ~ Trevis Dampier Sr.
It’s said that the frankfurter was developed there in 1487, five years before Christopher Columbus set sail for the new world. The people of Vienna (Wien), Austria, point to the term “wiener” to prove their claim as the birthplace of the hot dog. 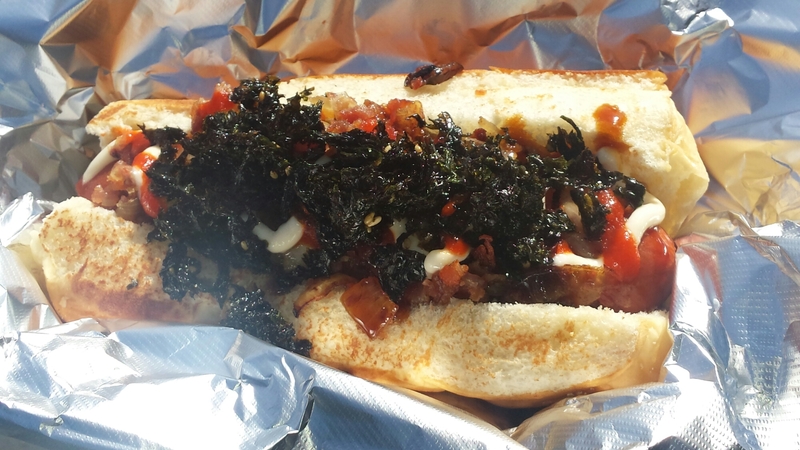 Kamikaze Dog, Space Needle, Tator Tots, Any Dogs they have! Being American means a lot of things..
Having an attitude of free choice, free speech, the right to achieve and succeed, to have your own ideas and to reach out for them; but we also have Hot Dogs!! 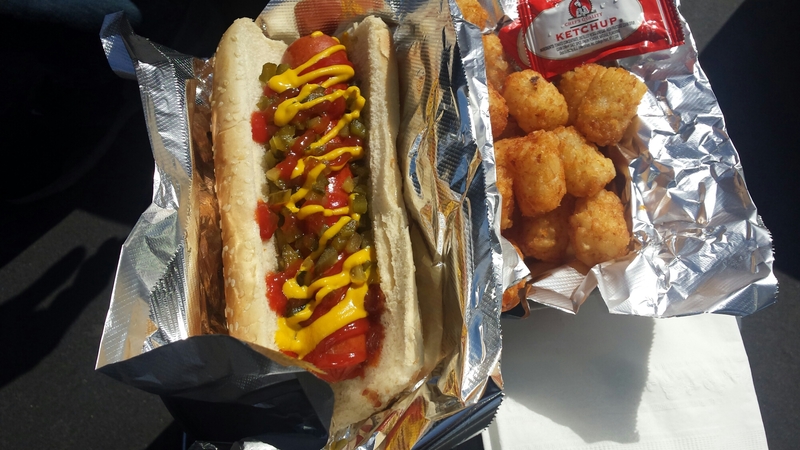 We love hot dogs at baseball games, football games, soccer games..
We’ll even eat hot dogs playing board games! Street corner hot dogs, hot dogs at the bar…. Bottom line hot dogs make us happy and I am a hot dog fanatic when the time is right! 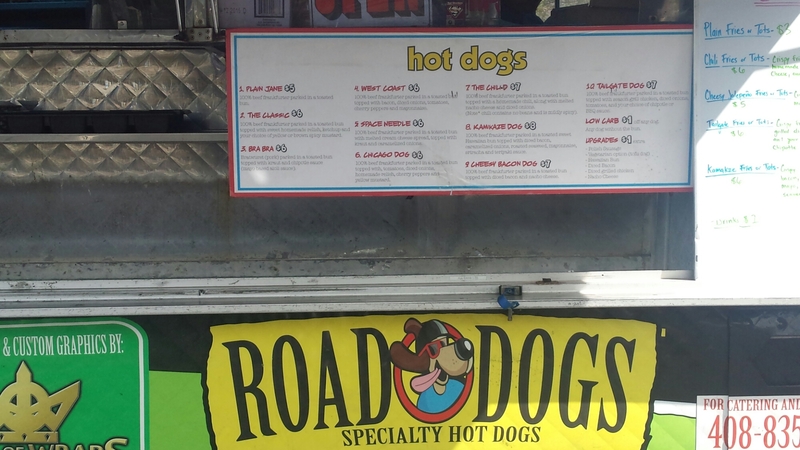 Today I was introduced to a carriage of gold when I came across this hot dog sensation of fantasy called Road Dogs. These chefs of heavenly delight have sculpted some true masterpieces of hot dog art! There was a great deal of selection from plain hot dogs or all the way to down right scientifically sophisticated dogs of love. 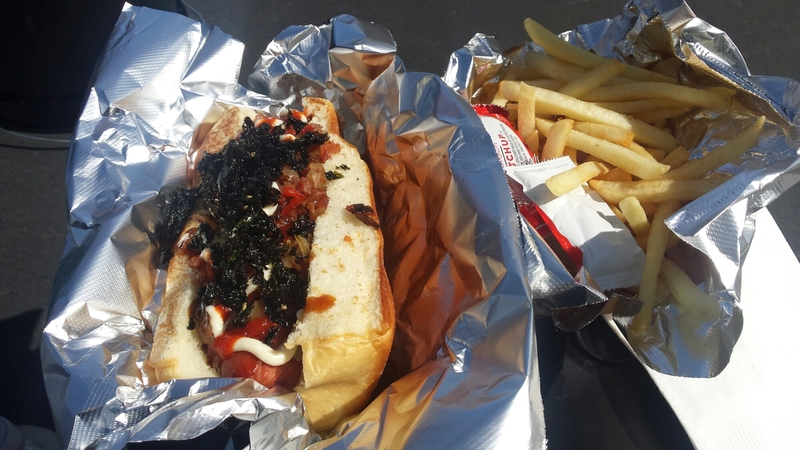 Today I’m feeling a bit inquisitive so I chose a Kamikaze dog which is a 100% beef frankfurter on a toasted sweet Hawaiian bun topped with diced bacon, caramelized onions, roasted seaweed, mayonnaise, sriracha and teriyaki sauce, while my faithful comrade Justin Englehaupt chose his plain with some tator tots. Trust me, I thought the same thing but let me say that this was the best hot dog I have ever tasted! Plump, juicy and flavorful mixed with a slight crunch of the Hawaiian bun combined with sweet tasting sauce with a slight sour from the seaweed and crunch from there as well. Bottom line it was a musical touch on the soul! That’s true live action eating! If you are in the Bay Area then make sure you check out their Facebook page to find out their next location as it will be well worth the drive! 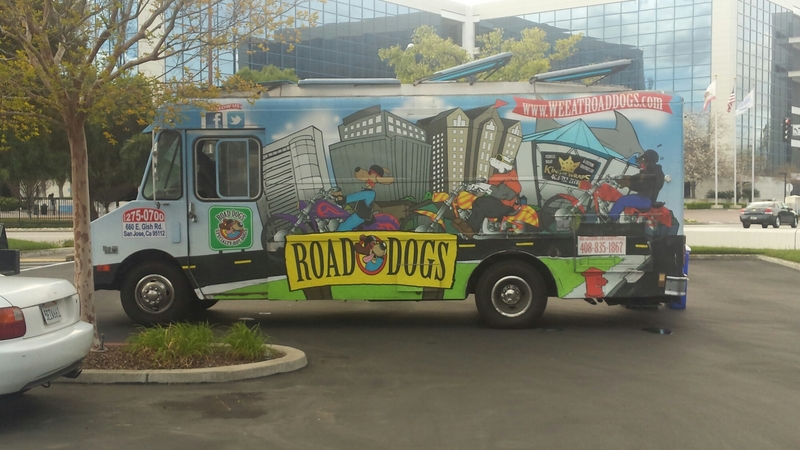 Good job Road Dogs! I hope you enjoyed today’s food truck adventure! I look forward to seeing you on the next run! Keep hope alive! < Previous Spaghetti in a different way every day!! Next > Give me a batch of Pacific Catch!! !